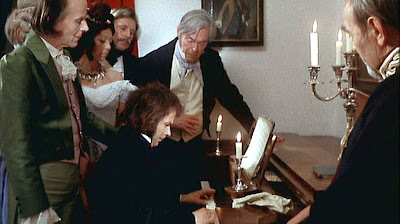 Werner Herzog’s The Enigma of Kaspar Hauser (Jeder Für Sich und Gott Gegen Alle, translation: "Every Man for Himself and God Against All”, 1974 ) chronicles the bizarre, but real, story of a teenage German boy whose brief life in the early part of the 19th century remains a subject of speculation to this day. Those familiar with writer-director Herzog’s often grim, expressionistic oeuvre are likely to assume that the weird circumstances presented in the film could only be the product of Herzog’s febrile imagination. But in fact the film follows the documented facts of a historical figure very closely. Nevertheless and despite the film’s conformity to the known account, it still falls very much within the scope of Herzog’s unique expressionistic vision. Nothing more was ever known about Hauser’s true origins or the identity of his assailant. 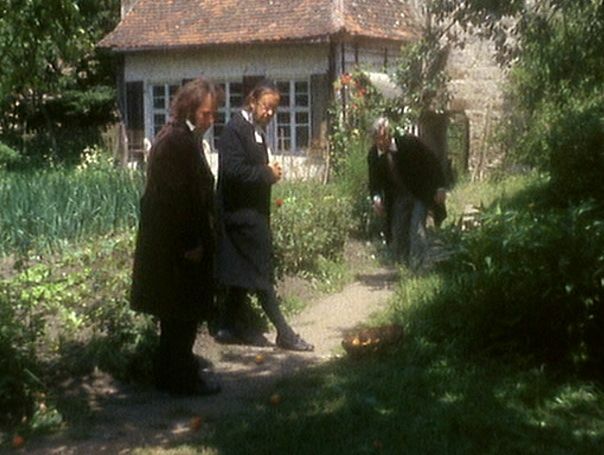 Because of the strange circumstances surrounding Kaspar Hauser’s appearance and death, he attracted considerable public interest and has always been the subject of controversy. Some commentators speculated that he was somehow connected with a succession struggle in the House of Baden, a German noble family. Many others have acc used Hauser of being a self-publicising fraud and habitual liar. These latter critics of Hauser claim that Hauser’s story of his entire upbringing taking place chained in a prison cell is not remotely credible and that noone could have survived very long under such conditions. These detractors even claim that Hauser even inflicted the publicized wounds on himself (the latter one, obviously, overdone) in order to further his notoriety. Now a filmmaker interested in the “enigma” of Kaspar Hauser might explore the true origins and background of Hauser, or he might question and investigate the authenticity of Hauser’s curious account. Herzog does neither of these things. 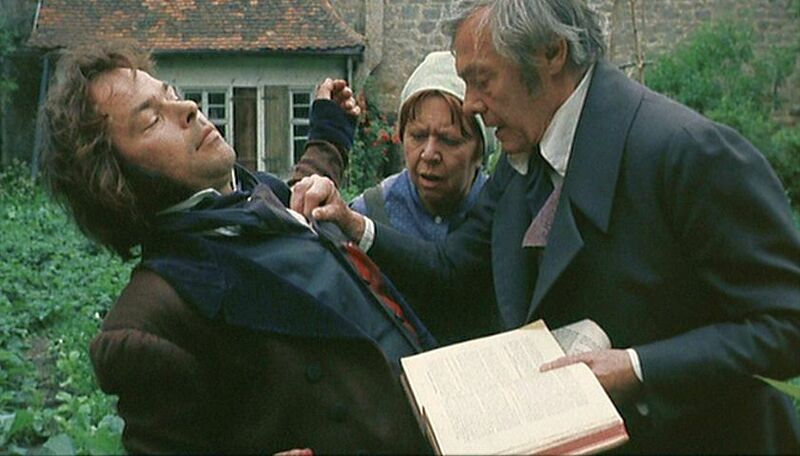 For him the enigma of Kaspar Hauser lies in an altogether different direction. For one thing, Herzog’s film shows none of the doubts about Hauser’s credibility and presents an image of complete sympathy for a man who struggles to understand the world and his place it. As such, the film metaphorically explores our own existential and unaccountable “thrownness” into a world beyond our understanding. A common theme in Herzog’s films is the profound alienation of the principle character from the world. This sense of alienation, indeed extreme isolation, reveals itself as a separation from the “humane”, rational world that perhaps only exists in our fantasies. 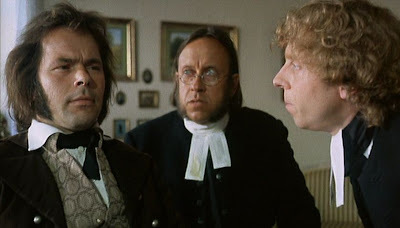 This is what Hauser feels in The Enigma of Kaspar Hauser, when he emerges from his simple “cocoon” – he finds a world of astonishing complexity, filled with beings who seem distant, often savage (“they are like wolves”), and forever beyond his comprehension. 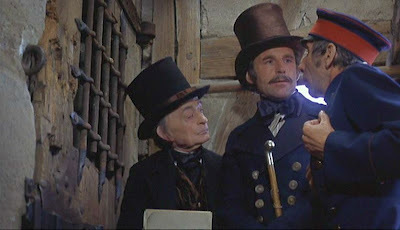 The film’s narrative structure has four basic sections that relate the course of Kaspar’s early background in the cellar dungeon, his initial assimilation into the communi ty, his further educational development, and ultimately his downfall. The first half hour of the film shows the extreme restrictions of Kaspar Hauser’s confinement in the cellar. He is chained to the floor, eats bread, and only has a small toy horse to manipulate. The man in the black cape arrives one day, and, while largely shielding himself from Kaspar’s gaze, rudely teaches Hauser to write his name and to walk upright. This man then deposits Hauser in a Nuremberg town square and tells him to wait there. 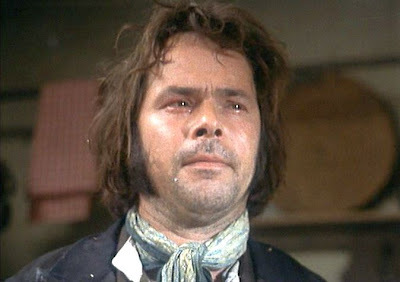 So it is emblematic of Herzog’s attitude towards these quizzical creatures that he depicts the gentle Hauser, who is shown to relate easily and intimately to other animals, immediately shrinking back in horror when confronted with the rooster. In order to reduce the upkeep of Hauser in the city jail, the town officials have him earn some money by putting him on exhibition at a local freak show. There he is espied by the schoolmaster, Daumer, who decides to take Hauser home and supervise his further education. After two years Daumer observes that Hauser is a naive but surprisingly apt student who intuitively asks questions that are not easily answered by his more experienced guardians, accustomed as they are to accept things as they are without question. “Why can’t I play the piano like I can breathe?,” Hauser asks at one point. When he is cross-examined by a logician, his intuitive logical reasoning is more pragmatically grounded than that of the academic. When he is given religious instruction by the local pastors, Hauser questions some of their basic tenets. He says he can’t understand how God could have created everything out of nothing. And during a lesson, Daumer tells Hauser that the movement of external, inanimate objects, such as apples, are subject to his own will. But when Hauser observes the chaotic motion of the thrown apple, he theorizes that the apple must move according to its own will. Thus rather than submitting to doctrinaire principles, Hauser is positing his own models based on the empirical evidence. This reminds us that while we viewers would envision his early confinement as terribly constrained and claustrophobic, to Hauser that small room was existentially the entire universe – nothing was beyond that cell. So the cell was vast, a complete world all by itself. Now, out of his confinement the world of the same "size", but different -- it is now infinitely more complicated and animated with hostile forces. While the film up to this point has depicted Hauser’s progressively successful accommodation to our rationalized world, the final act suggests the deep mysteries that still remain, perhaps not only to Hauser but to all of us, as well. The effete Lord Stanhope comes and offers his patronage to Hauser, but the stylized manners of him and his entourage are overwhelming to Hauser. Ultimately the count concludes that Hauser is uncivilized and departs without him. Then Hauser experiences the first attack by the man in the black cape. While recover ing from this injury, Hauser recounts a mysterious dream he has had of a mass of people all trying to climb a steep mountain in murky fog. At the top of the mountain, awaiting them, in this dream was Death. Later Hauser is attacked again, this time fatally. On his deathbed he relates a story fragment this is also dreamlike – it tells of a wandering tribe lost in the Sahara Desert who are guided by a blind Berber to a “city in the North”. The overall strength of Herzog’s film narrative is significantly enhanced by the performance of “Bruno S.” (Bruno Schleinstein) in the role of Kasper Hauser. It was an ingenious move of Herzog to insert Schleinstein, a street musician with no previous acting experience and who had spent much of his early life in and out of mental institutions. Indeed, Schleinstein’s every encounter in the film seems intuitively authentic and entirely original. 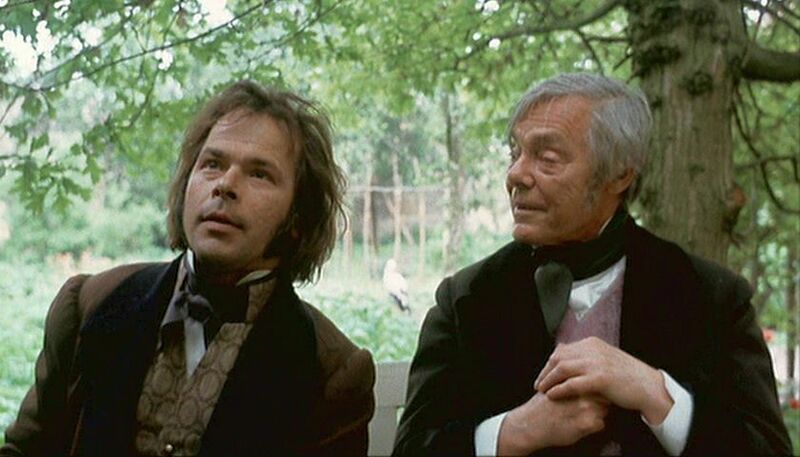 Though Schleinstein was forty-one years old at the time and thus far older than the teenage Hauser he was supposed to depict, that age difference is not fatal to the telling, and his performance is magnetic. It was the success of his performance here that inspired Herzog to craft the screenplay for Stroszek (1977) expressly for Schleinstein. Commenting on Schleinstein recently at the time of his death, Herzog remarked that “. . .with all the great actors with whom I have worked, he was the best.” . Hauser’s two “dream” stories towards the end of The Enigma of Kaspar Hauser convey the suggestion that all mankind is lost in a wilderness and is wandering towards an indeterminate destination and fate. We seem to be searching for something, but for what? The mysteries behind this search were what Hauser sought to understand, but he received little assistance or support from his supposedly more enlightened contemporaries. The routine explanations, procedures, and “reports filed” in our conventional society (as epitomized by the town secretary in the film) fail to address these ultimate questions in any meaningful way. In the end Hauser was destroyed without provocation by an unfathomable foe. Why? Why are we all created with the capacity to ask these existential questions and then doomed to die without answers? That is the real enigma of Kaspar Hauser.